The Rocky Mountains of Montana are the headwaters for some legendary rivers like the Missouri, the longest river in the United States. On the Continental Divide, Montana is the only state with rivers that drain into the Gulf of Mexico, Hudson Bay, and the Pacific Ocean. The Missouri and the Yellowstone Rivers cut across the expansive Great Plains of Montana. Flathead Lake is the largest natural freshwater lake west of the Mississippi River, and the largest natural lake in Montana. Fort Peck Lake is the fifth largest man-made lake in the United States, and the largest reservoir in Montana. About 1% of the state (about 1,650 square miles) is covered by water. What is Montana’s maritime heritage? People moved into Montana at the end of the last Ice Age more than 10,000 years ago. Historically, the Arapaho, Assiniboine, Blackfeet, Cheyenne, Crow, and Gros Ventre tribes lived in the plains, and the Bannock, Kalispell, Kootenai, Salish, and Shoshone tribes lived in the mountains. The first non-natives to venture into Montana probably were French trappers as early as the 1740s. The Lewis and Clark Expedition traveled on the Missouri, Yellowstone, and Marias Rivers as it crossed and re-crossed Montana during 1805 and 1806. Fur trappers and traders came to Montana in great numbers beginning in 1807. Fur trading posts like Fort Union, Fort Benton, and Fort Peck were established at strategic points along the rivers. 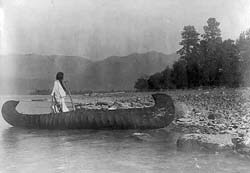 Buffalo-skin bullboats, canoes, pirogues, Mackinaw boats, keelboats, and rafts were commonly used to navigate Montana’s rivers. Steamboats were redesigned with shallower drafts and flatter hulls for use on Montana’s rivers but few boats ventured up the Missouri River beyond Fort Union. 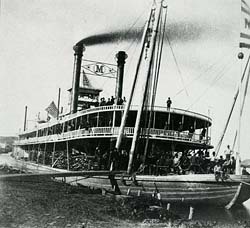 Steamboats reached Fort Benton, the head of navigation on the Missouri River, in 1860. Steamboat traffic to Fort Benton boomed after gold was discovered in Montana in 1862, and it flourished until the railroads were completed across Montana in the 1880s. Navigation on Montana’s western rivers during the 19th century was associated largely with fur trapping and trading, survey expeditions, and logging operations. For a brief period ending in 1870, a steamboat line operated between Lake Pend Oreille and Thompson Falls, the head of navigation on the Clark Fork of the Columbia River. 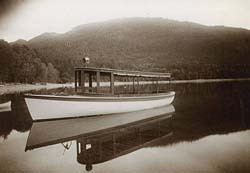 Commercial boating developed on Flathead Lake beginning in the 1880s to transport passengers, merchandise, lumber, agricultural products, and livestock. In the early 1900s, sight-seeing by boat on Whitefish Lake was quite popular. The Missouri River and its tributaries in Montana are shallow, full of snags and sandbars, and characterized by constantly shifting channels, swift currents, and prairie winds. Navigation was difficult and boats often became irreparably damaged or mired down. Ice break-ups, boiler explosions, and fires also destroyed many riverboats. As a result, Montana’s rivers and lakes are thought to contain the wrecks of many vessels. Hundreds of vessels were lost on the upper Missouri River in the 19th and early 20th centuries. Among those lost in Montana are the Chippewa that burned at Poplar River in 1861, the James D. Rankin that wrecked on Yellowstone River in 1877, the Anna Lee sunk at Glasgow in 1881, the Red Cloud sunk at Wight Point in 1882, and the Butte that burned above Fort Peck in 1883. The location where the steamboat Red Cloud wrecked became known as Red Cloud Bend. As the river channel shifted over time, the Red Cloud became buried under land bordering the river. Ironically, the Red Cloud is again underwater because the area where it is buried now is at the bottom of Fort Peck Lake behind Fort Peck Dam. Montana’s reservoirs contain other sites, too, like ruins of prehistoric and historic sites that became inundated when reservoirs were filled with water. Libby Reservoir’s Lake Koocanusa, for example, contains a diverse range of sites from Paleo-Indian to modern times including the original townsite of Rexford. Who takes care of Montana's underwater archeological sites? The Montana Historical Society promotes and facilitates the preservation of the state’s cultural properties including archeological sites on land and underwater. The Society accomplishes this work through the State Historic Preservation Office and its State Archaeology program. The Office maintains the State Antiquities Database; reviews State Antiquities Permit applications for work on state lands; consults on federal and state agency actions that may impact archeological sites; assists partners in the systematic survey, evaluation, and nomination of archeological sites to the National Register of Historic Places; and supports heritage education efforts. The Montana Department of Natural Resources and Conservation is responsible for archeological sites on state-owned land and navigable waterways. Its Trust Land Management Division administers the beds of state-owned rivers, streams, lakes, and related acreage, and its Water Resources Division manages and maintains state-owned dams, reservoirs, and canals. The Federal Government takes care of many archeological sites in Montana because it owns and administers 37 percent of the land in the state. This includes public and Indian land managed by the Bureau of Indian Affairs and the respective Indian tribes, the Bureau of Land Management, the Fish and Wildlife Service, the National Park Service, the Forest Service, the Bureau of Reclamation, and the Department of Defense. You need a State Antiquities Permit from the State Historic Preservation Officer and a Paleontologic\Cultural Materials Collection License from the Department of Natural Resources and Conservation to excavate or remove archeological materials on state lands and in state waters in Montana. You need a Permit for Archeological Investigations from the appropriate federal agency when the site is on federally owned or controlled land. Permits are issued to qualified individuals at reputable museums, universities, colleges, or other historical, scientific, or educational institutions, societies, or persons for the purpose of increasing knowledge. Materials collected must be deposited in a museum or other qualified institution for permanent preservation. What laws concern underwater archeology in Montana? Laws about the state’s archeological sites are set forth in Chapter 3 (Antiquities) of Title 22 (Libraries, Arts, and Antiquities) of the Montana Code Annotated. Laws about the state’s navigable water ways and related lands are covered in Title 70 (Property) and Title 77 (State Lands). Regulations for the Montana Historical Society are contained in Chapter 120 (Organization) and Chapter 121 (Procedures) of Title 10 (Education) of the Montana Administrative Regulations.